I usually celebrate my birthday with a chocolate pie, but after the race and then attending a party with one of M’s Antarctica coworkers I didn’t feel up to making one. 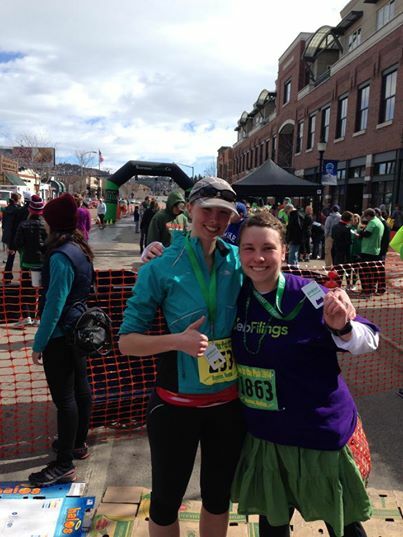 Instead, I made one yesterday and added a teensy bit of Irish flair for today’s post. 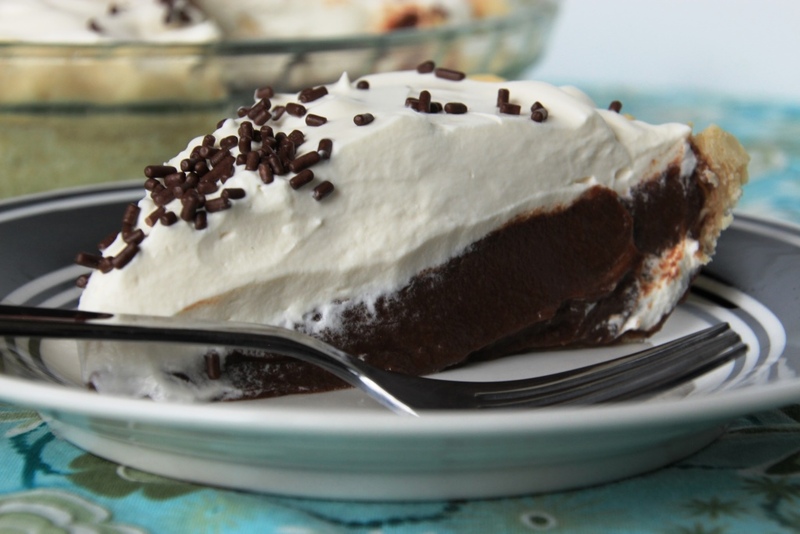 Chocolate pie is a long-standing favorite of mine and probably my most requested birthday dessert, although cherry pie would be a close second. 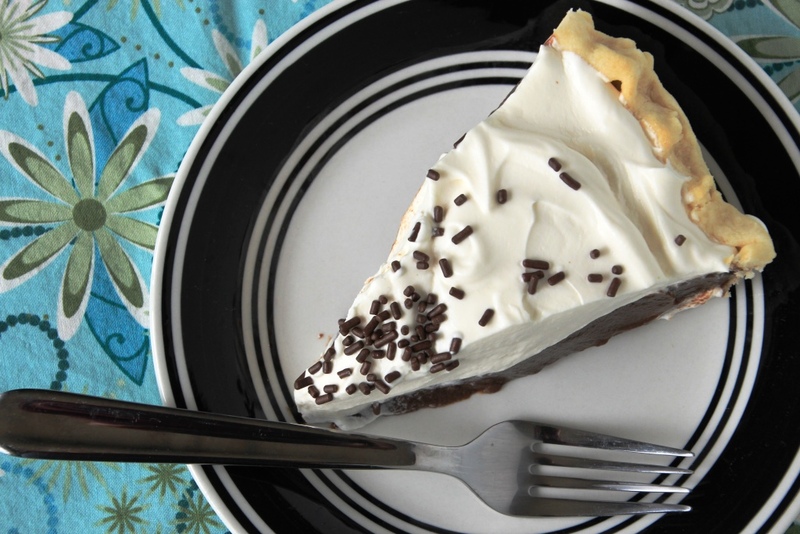 Even from scratch, chocolate pie is an easy dessert to make, and a hard one to screw up, which makes it great for beginners. I can even personally attest that whipped cream is stiff enough for regular birthday candles, although I skipped those this year. 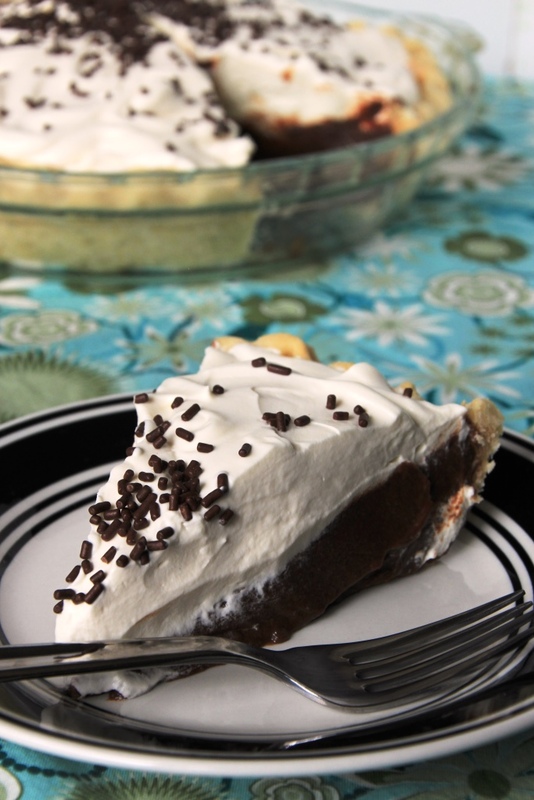 Flaky pie crust, creamy pudding, and fluffy whipped cream are a combination that can’t go wrong, unless you are one of those weird people that doesn’t like sweets. (Seriously, I do not understand this. No judgments, just confusion.) But if you are one of those people, you probably aren’t reading this post anyway. 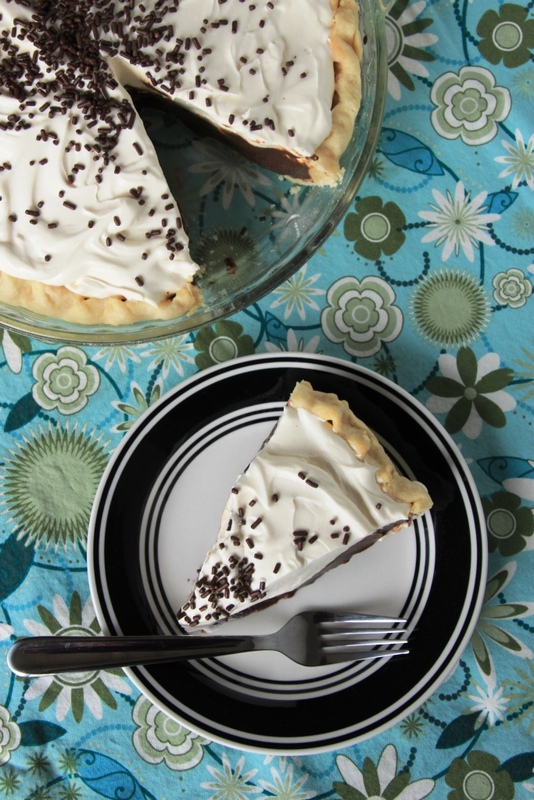 This pie is fairly rich, but the whipped topping helps keep it from feeling overly dense. Even so, you may want to start with a smaller piece than I have in my pictures, and make a note to go back for seconds. It should keep for a few days in the fridge, but it would be best to have a few friends over to share it. I’m sure they won’t mind helping you out. Measure shortening into a small bowl and place in the freezer for 15-20 minutes. Pour water and a few ice cubes into a cup and set aside. In a small bowl, whisk the flour and salt together until well combined. After shortening is cold, combine with the flour and salt and mix with a pastry blender (or a fork) until blended into pea-sized pieces. Add ice water one tablespoon at a time, mixing gently after each addition. Repeat until all pastry is moistened and it all sticks together. On a lightly floured surface, gently flatten pastry into a disc, and then roll out large enough to fit your pie plate. Transfer dough to pie plate and crimp the edges. Bake crust for 10-12 minutes, then set aside while you make the filling. Place milk, half and half, and chopped chocolate into a medium sauce pan. Over medium heat, warm the mixture until chocolate is melted, stirring occasionally. In a separate bowl, stir together egg yolks and sugar until well mixed. Add corn starch, vanilla, salt, and cocoa (if desired) and stir until completely combined. When the chocolate is melted, slowly pour the hot liquid into the egg mixture, whisking constantly until smooth. 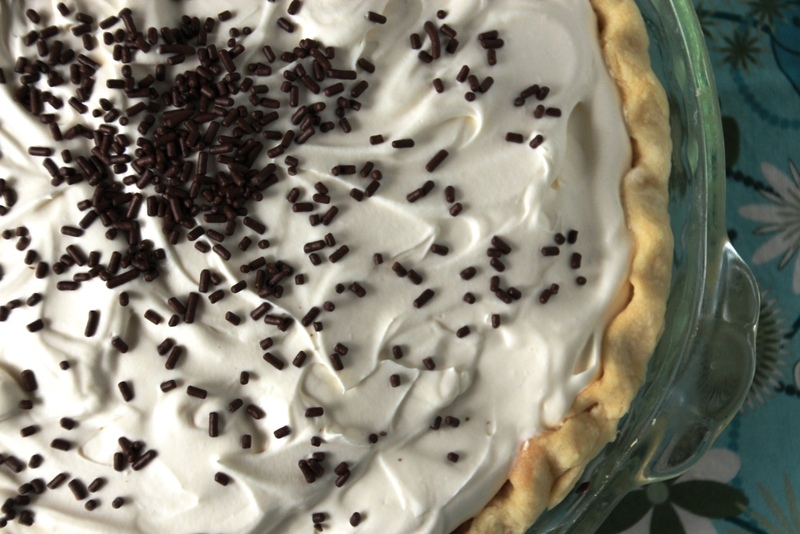 Remove from the heat and stir gently until pudding is smooth, then pour directly into prepared pie crust. Cover immediately with plastic wrap, pressing it directly onto the filling to prevent a skin from forming. Refrigerate at least two hours, or until ready to serve. 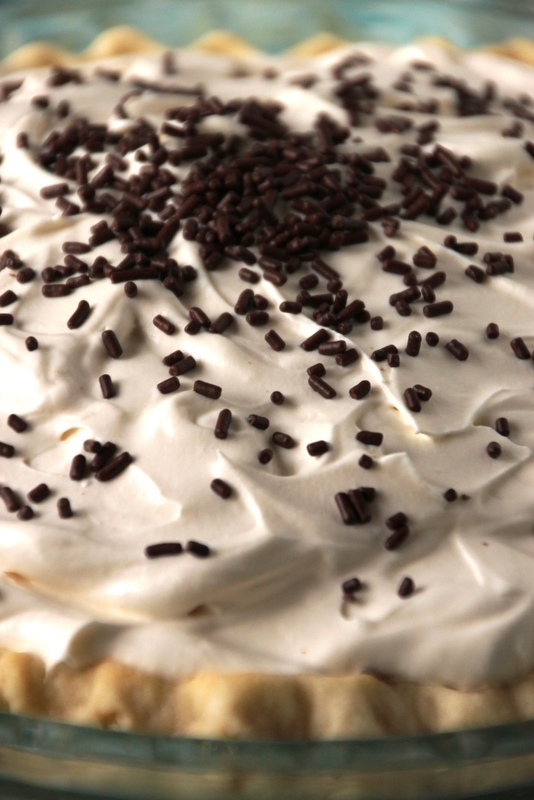 Then top with whipped cream. Using an electric mixer (whisk attachment for a stand mixer) beat the cream until very soft peaks form. Gently stir in the sugar and Baileys until just incorporated. Continue beating the cream until soft-medium peaks form. Top with chocolate jimmies, mini chocolate chips, or chocolate curls, if desired. Return to fridge, or serve immediately. 1 I really don’t think you can over-prick a pie crust. 2 Don’t throw out the egg white, make meringues! 3 I like richer chocolate flavor, but if you’re not into dark chocolate just leave this out. It’ll still be delicious. 4 If you just want regular whipped cream, use 3-4 tsp vanilla instead. 5 You will probably have about a cup or more left over. Store in a sealed container in the fridge and it’ll keep for several days. It’s great to use on hot chocolate or ice cream or to eat with a spoon. This pie was amazing! I used a graham cracker crust instead, because that’s what my boyfriend requested. I had never made pudding before and it was surprisingly simple. The pie was very *VERY* rich, so I would say that it could feed 10-12 people easily. Even eating it while still hungry after dinner, we were stuffed afterwards. I am definitely going to make it again! Next time I’ll make it the night before, or earlier in the day though, because the flavor and texture was better day 2, after it had time to set better.